Fans will finally get to see Star Wars: The Last Jedi in theaters during sneak preview screenings across the country tomorrow night, but if you're looking for an IMAX upgrade, then you're in luck. We have a new contest where we're teaming up with IMAX to give away The Last Jedi IMAX tickets, along with some new Funko POP figures and The Last Jedi t-shirts as well! What could be better than seeing Star Wars: The Last Jedi in IMAX, for free? There are probably some things that are better... but not many. 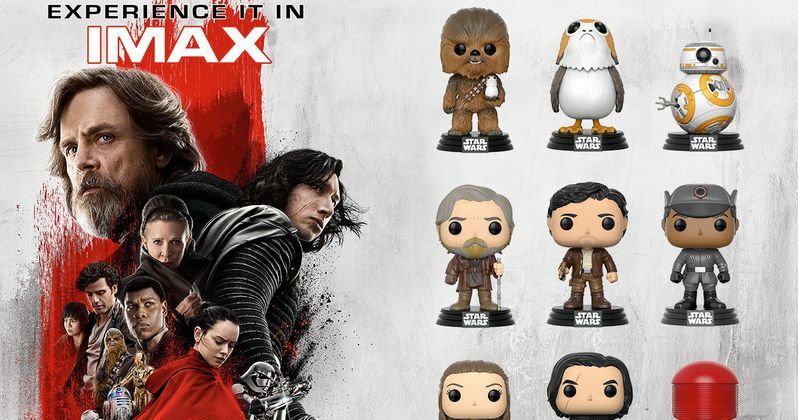 If you aren't among the lucky winners of The Last Jedi tickets, there's still a chance you can take home one of 12 new Funko POP! Figures including a Porg, Captain Phasma (Gwendoline Christie), Kylo Ren (Adam Driver), Rey (Daisy Ridley), Finn (John Boyega), Luke Skywalker (Mark Hamill), BB-8, Poe Dameron (Oscar Isaac), Chewbacca (Joonas Suotamo), Supreme Leader Snoke (Andy Serkis), BB-9E, and a Praetorian Guard. The IMAX tickets are valued at $23 apiece, and if you go to IMAX theaters this weekend, you'll get even more swag. Back in October, Last Jedi IMAX exclusives were revealed, with fans who attend IMAX screenings at AMC Theatres, for their new Star Wars Sunday initiative, receiving a special limited edition posted designed by Dan Mumford. This poster will be given out during Sunday screenings between December 17 and January 7. If you're more of a Saturday movie person, Regal Cinemas will launch Star Wars Saturdays between December 16 and December 30, where the first 500 guests will receive an exclusive collectible ticket featuring unique art. There will be new artwork revealed each week, with this first collectible ticket featuring Rey (Daisy Ridley) and Luke Skywalker (Mark Hamill). In Lucasfilm's Star Wars: The Last Jedi, the Skywalker saga continues as the heroes of The Force Awakens join the galactic legends in an epic adventure that unlocks age-old mysteries of the Force and shocking revelations of the past.The film stars Mark Hamill, Carrie Fisher, Adam Driver, Daisy Ridley, John Boyega, Oscar Isaac, Lupita Nyong'o, Andy Serkis, Domhnall Gleeson, Anthony Daniels, Gwendoline Christie, Kelly Marie Tran, Laura Dern and Benicio Del Toro. Star Wars: The Last Jedi is written and directed by Rian Johnson and produced by Kathleen Kennedy and Ram Bergman. J.J. Abrams, Tom Karnowski and Jason McGatlin are the executive producers. Star Wars: The Last Jedi opens in U.S. theaters on December 15, 2017. We reported earlier this week that LucasFilm is eyeing a $425 million global opening weekend for Star Wars: The Last Jedi, which would be the fifth highest in box office history. The movie is already a critical success, with an impressive 94% Fresh rating on Rotten Tomatoes, as fans get ready to finally see this big screen adventure starting tomorrow. Leave a comment here at movieweb.com, on our Facebook page, at Twitter, on Instagram or on Google+ and tell us why you deserve these prizes and we'll pick a user at random to win!